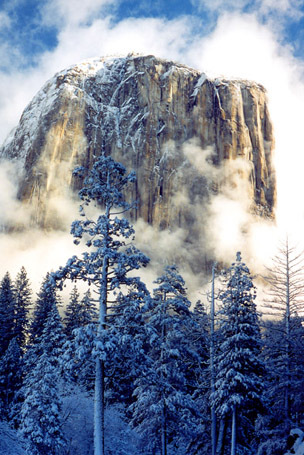 This is the giant piece of granite in Yosemite Valley, one of the largest and most famous rocks in the world. Yosemite is visited by a tremendous number of people from all over the world. And it is said that there are more pictures taken in this small valley than anywhere else in the world. That is why I rarely visit except in the winter, the only time when it is not overcrowded. You can see by the rest of my pictures that I tend to go where the crowds don't. Since everyone asks, I'll tell you -- the reason why the snow on the trees appears blue is because the sun is not shining on them. They are only illuminated by the blue sky. If you were standing here your eyes would deliver the blue color to your brain, but your brain would "correct" that color to what you expect it to be, and so you would "see" white.